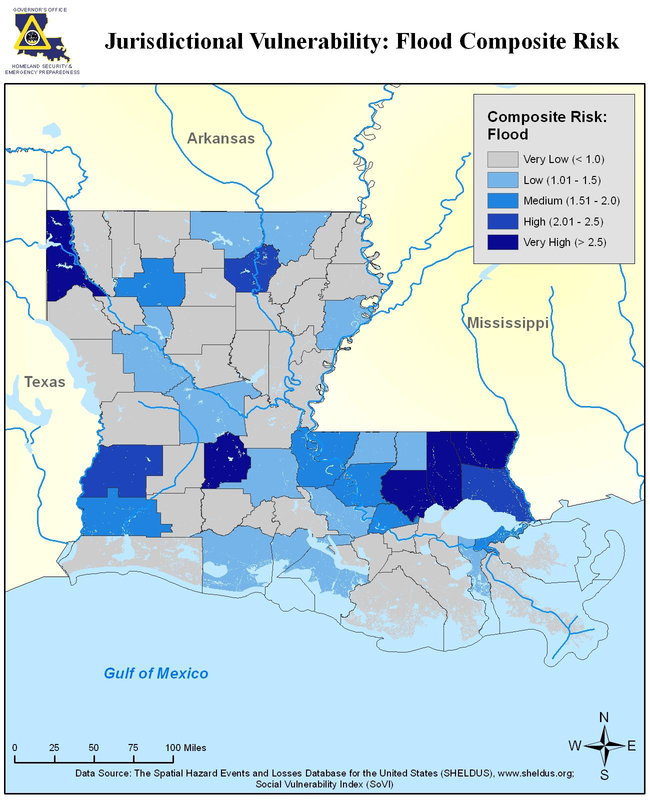 "In Louisiana, five specific types of floods are of main concern: riverine, flash, ponding, backwater, and urban. Riverine flooding occurs along a river or smaller stream. It is the result of runoff from heavy rainfall or intensive snow or ice melt. The speed with which riverine flood levels rise and fall depends not only on the amount of rainfall, but even more on the capacity of the river itself and the shape and land cover of its drainage basin. The smaller the river, the faster water levels rise and fall. Thus, the Mississippi River levels rise and fall slowly due to its large bankfull capacity. Generally, elongated and intensely-developed drainage basins will reach faster peak discharges and faster falls than circular-shaped and forested basins of the same area. Flash flooding occurs when a locally intense precipitation inundates an area in a short amount of time, resulting in local streamflow and drainage capacity being overwhelmed. Ponding occurs when concave areas (e.g., parking lots, roads, and clay-lined natural low areas) collect water and are unable to drain. Backwater flooding occurs when water slowly rises from a normally unexpected direction where protection has not been provided. A model example is the flooding that occurred in LaPlace during Hurricane Isaac. Although the town was protected by a levee on the side facing the Mississippi, floodwaters from Lake Maurepas crept into the community on the side of town opposite the Mississippi River. Urban flooding is similar to flash flooding but is specific to urbanized areas. It takes place when storm water drainage systems cannot keep pace with heavy precipitation, and water accumulates on the surface. Most urban flooding is caused by slow-moving thunderstorms or torrential rainfall. The next map shows the probability of flooding throughout the state, by year. 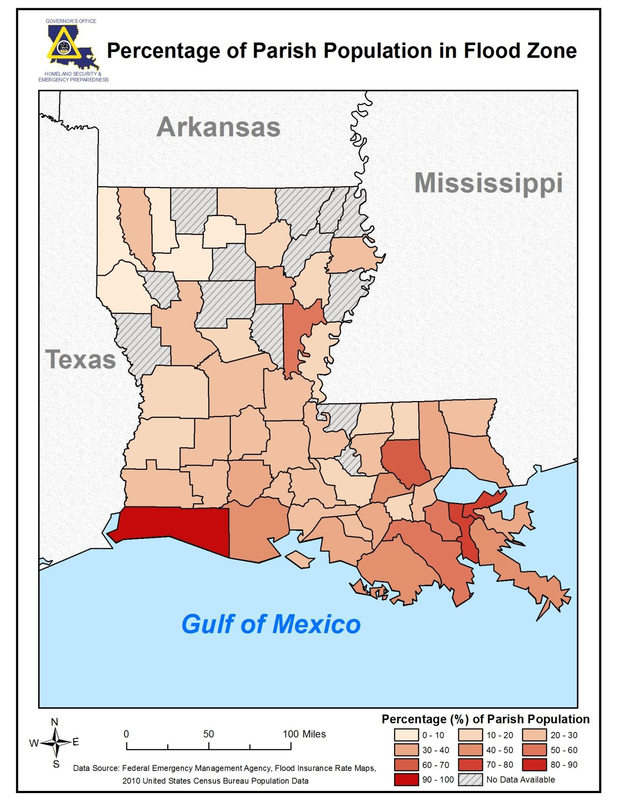 About half of the state floods once every 1 to 2 years or more. 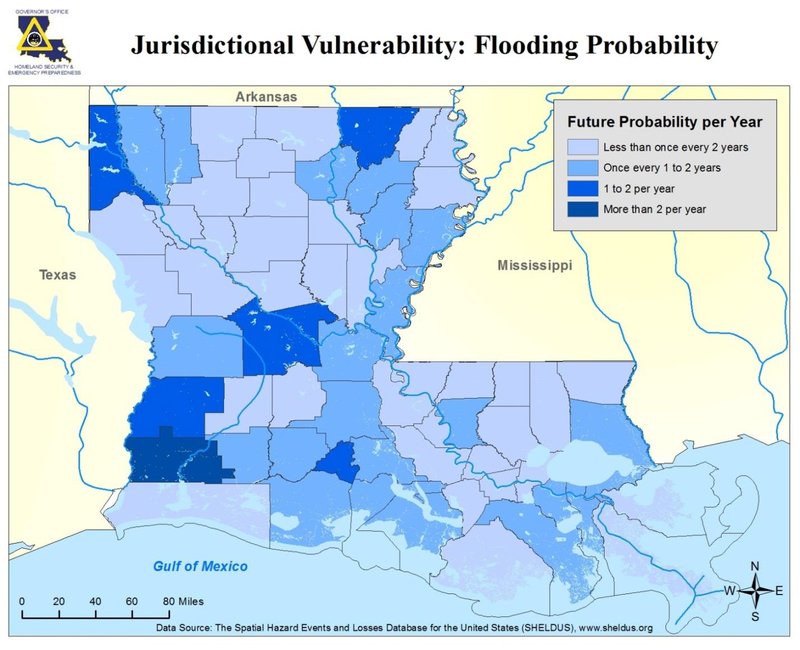 The final map reveals the flood risk throughout the state. In many areas of the state, the flood risk is high or very high.